Center of Pakistan and International Relations (COPAIR) organized a tree plantation activity to promote Green Pakistan. The saplings were planted in Gulberg Islamabad, one of the leading housing schemes of Pakistan, which has been designed on the principles of sustainable development. A large number of people from civil society, businessmen and politicians joined hands with COPAIR to plant trees in Gulberg Islamabad. 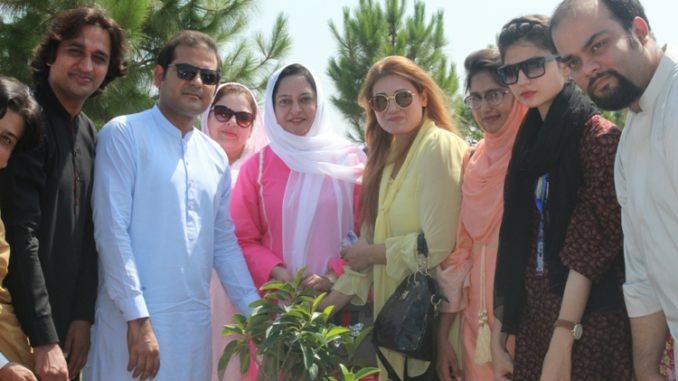 Ms. Amna Malik, President COPAIR lead the tree plantations drive. Ms. Amna Malik highlighted that the inspiration behind this initiative is to make Paikstan green and support Gulberg Islamabad with its Green Savour initiative. COPAIR President praised that this is the only housing scheme in Pakistan designed on sustainable urban design to promote green housing project.